OTTAWA -- Unco-operative provincial governments have been making the effort to get more infrastructure dollars into Canada's cities a challenge, Prime Minister Justin Trudeau said Monday. 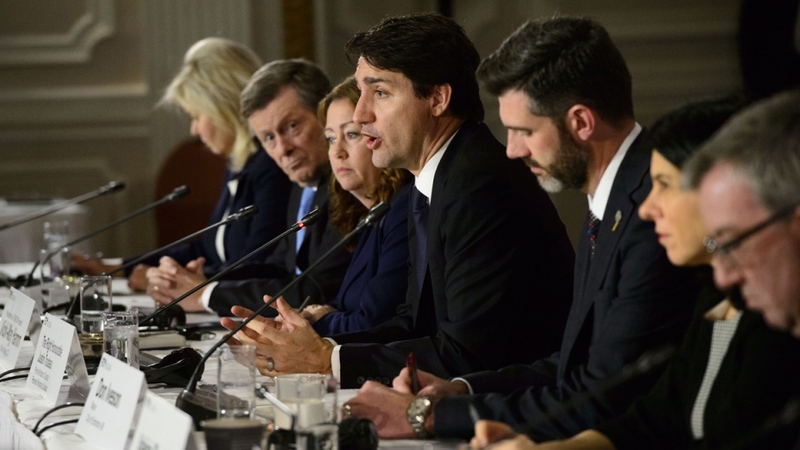 Trudeau, whose government has struggled to fulfil tens of billions worth of infrastructure commitments, made the remarks in Ottawa before a meeting with more than a dozen of Canada's big-city mayors. He didn't single any provinces out by name. "It's not always easy -- we understand that the political context varies a little bit from one end of this country to the other and there are provinces that don't completely have the same attitude when it comes to tangible investments in their communities and in the big cities," Trudeau said in French before switching to English. "We're having sometimes certain challenges with the provinces in various ways." Champagne, for whom speeding up the rollout of infrastructure investments is a top priority, said the arrival of new governments has slowed down some of the intake, review and approval of projects. He did note these delays are normal when there's a change in government. "But I think now everyone should be well settled," said Champagne, who added that with construction season approaching he would like to see progress. "We have big needs ... Now it's delivery time -- it's game time." After the meeting with Trudeau, Quebec City Mayor Regis Labeaume said his Ontario peers shared their concerns about a lack of progress from their province on public transit. Basically, they said projects on Ontario Premier Doug Ford's desk aren't moving much, Labeaume said. "My Ontario colleagues find this a bit difficult," Labeaume said when asked about Trudeau's comments on provincial challenges. "I don't know why -- maybe it's politics." Finance Minister Bill Morneau also met with the mayors Monday. He was asked about Trudeau's comments on challenges with some provinces. "What he's identifying is that in order for us to actually conclude on infrastructure projects it requires alignment between the federal government, the provincial government and municipalities," Morneau said. "If there's not agreement on which project is most high priority, it can present challenges." The mayors, who make up the big-city caucus of the Federation of Canadian Municipalities, said they pressed Trudeau in the meeting to create a direct, formal channel between local communities and Ottawa -- one that circumvents provinces, if necessary. Edmonton Mayor Don Iveson told reporters that the groups asked Trudeau to establish an intergovernmental forum that would put cities at the decision-making table along with the provinces and Ottawa. "It's crucially important if you've got provinces that are not willing to engage on transit or not willing to engage on housing or not willing to engage on climate for there to be a more formal mechanism for local government and the federal government to work together to achieve those policy outcomes," he said. Iveson said the mayors also urged Trudeau to top up the federal fund for disaster mitigation by $2 billion in his spring budget and to create a permanent federal mechanism that commits to public transit funding well beyond a 10-year time horizon to help local leaders make long-term plans.